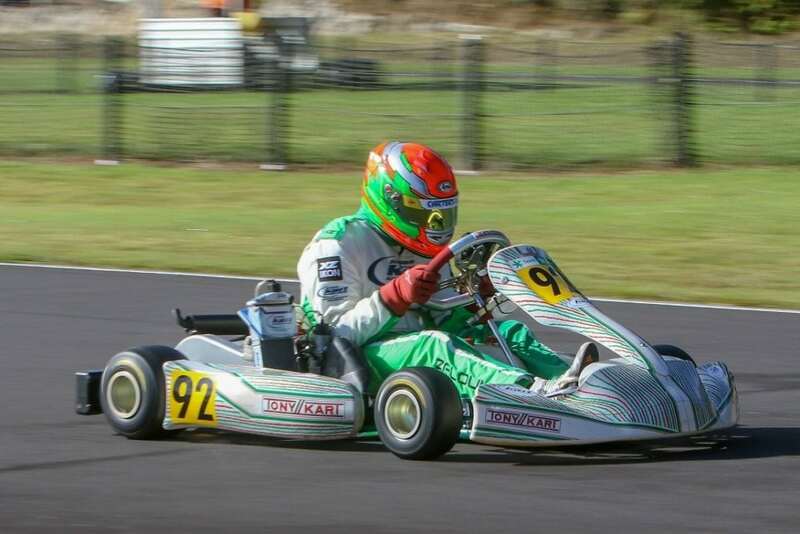 This year Tony Kart has come out on top in the battle for the manufacturers cup at the Giltrap Group 2018 National Sprint Championship contested at KartSport Rotorua’s Century Batteries International Raceway over Easter Weekend. Tony Kart’s inaugural win ended a two year reign by Sodi Kart. The meeting started well with lots of Tony Kart drivers qualifying in the top six. Tony Kart points were boosted by wins in three of the classes, Zach Zaloum - Rotax Heavy, Jaiden Pope - Rotax Junior and Louis Sharp - Mini Rok, (Mini Rok is currently under appeal but will not change the overall result). Tony Kart also achieved lots of podiums across most classes. A few of the drivers started well back in the prefinals with Rotax Heavy driver Zach Zaloum starting from the back after an electrical issue stopped his engine on the warm up lap. Zach managed to restart and get up to fourth from the back and broke the track record in the process. Other drivers made great progress to gain better starting position for the final and make podiums in the finals. Jenson Bate started the Mini-Rok final in 21st and came through to finish 3rd, well done Jenson. A huge thanks to all the drivers, driver’s families and the shops that are supporters of the brand. We really appreciate it all and we will continue to do our absolute best to get you all to the front. Special thanks to Harrison Hoey and Jaiden Pope for crossing the ditch to compete at the meeting and drive Tony Karts. Hoey qualified on pole and finished the final in third. Pope only arrived at the track for the very first time on Friday morning and qualified in 11th but he worked his way forward through the heats and prefinal to start the final in P2. He got to the front straight away and lead the entire race to win his class. A terrific effort in any one’s book. Well done Jaiden. Caption: Zach Zaloum winning the 125cc Rotax Max Heavy class. Credit: Fast Company/G Hughes.